Brussels, Belgium, 2015-3-27 — /Travel PR News/ — Carlson Rezidor, one of the largest and most dynamic hotel groups worldwide, announces the very first Park Inn by Radisson in Romania: the Park Inn by Radisson Bucharest Hotel & Residence featuring 210 keys is scheduled to open in Q4 2015. It will be part of Carlson Rezidor’s first dual-branded property in the country -openings its doors right next to the existing Radisson Blu hotel. Park Inn by Radisson is a vibrant mid-market brand, Radisson Blu is Europe’s largest upper-upscale brand. “We are delighted to bring a Park Inn flagship to Romania, a country presenting many more opportunities for mid-scale properties in greater Bucharest and secondary cities. Building on the success of the well-performing Radisson Blu, the Park Inn will capture additional market segments and allow the use of synergies related to sales, marketing and operations”, said Wolfgang M. Neumann, President & CEO of Rezidor. The Park Inn by Radisson Bucharest Hotel & Residence will be designed by Belgian-based Creneau International, a visionary and trendsetting design agency. It will offer 210 rooms & apartments, a lobby lounge & bar, an all-day restaurant, 4 meeting rooms and a pre-function area, and 80 parking spaces. It will target business and leisure guests alike with a focus on long-term customers and families. The building complex also hosts a big shopping area and a fitness center with indoor and outdoor pool. The site of the dual-branded hotel is in the heart of Bucharest close to the main high-street, National Theatre, University and Parliament. Easily accessible, the complex is 16km from Bucharest’s international airport that handles 8 mio passengers per annum. 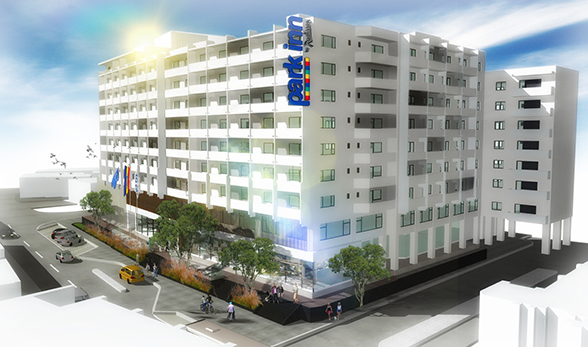 The Park Inn by Radisson Bucharest Hotel & Residence will be operated by The Rezidor Hotel Group. This entry was posted in Business, Hospitality, Hotels, Travel Services, Travelers and tagged Carlson Rezidor, Park Inn by Radisson Bucharest Hotel & Residence, Wolfgang M. Neumann. Bookmark the permalink.